Hunsingore Kirk: Situated just north of Yorkshire’s River Nidd, Hunsingore has been a judgement seat, or ‘gorsedd’, since the Iron Age times of the Ancient British. Hope yooz all well and hanging. I’ve been out in the countryside this past month revisiting umpteen places in England and Wales, doing new fieldwork for a book I’m writing about the ancient law. About five years ago, I started investigating the old belief that ‘no one shall be above the law’, and the time has come at last to set it all down. That old belief has been proved to be a crock, of course, for the law has always been something to ‘get around’, hence those privileged few who walked outside its rules were ‘before the law’ (‘privi-liege’). As I explained in THE MEGALITHIC EUROPEAN, therein lie the roots of the law man as the privileged lord. And though originally intended to denote ‘My Lawed’, this idea is nowadays more clearly shown in its more-literal French equivalent ‘Mon Liege’. Of course the wonderful thing about Britain’s landscape is that many of its remaining law sites first opened for business way back in prehistoric times, so I shall in this next book be directing readers to the best surviving examples via maps and photographs. 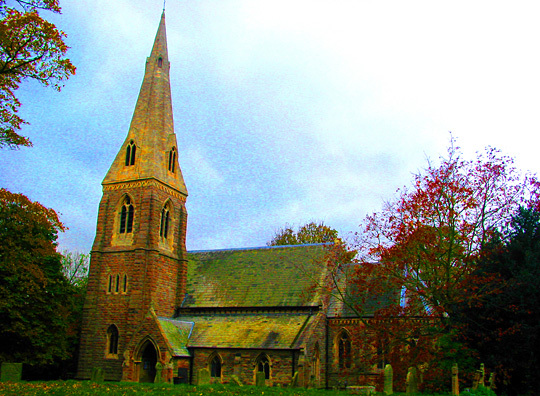 But I was delighted last week to visit the ancient Yorkshire parish of Hunsingore, upon whose law mound a succession of councils had made their judgements going back to the Knights Templars, the Normans and the Vikings before them, and an Ancient British ‘gorsedd’ even before them. Indeed, the presence of the Rudgate, a Roman police road that passed nearby, intimates that this gorsedd (law seat) was causing the Roman conquerors trouble at least as far back as the Iron Age. Now, I know it’s peculiar to illustrate a Drudion with a photograph of a church, no matter how Scando-Germanic its origin may be. But this heathen Archdrude ain’t no tantrum thrower, and I’m convinced that with rigorous study of the turbulent seas that our ancestors navigated in order to get us here, so shall we with their experience better navigate our way towards a brighter future. With all of the aforementioned in mind, it’s somehow poetic that the music I’ve most enjoyed this month has been performed by Heathens (Waldteufel), Jews (Grave In The Sky), a rather pagan Christian (Stone Breath) and one Satanist (Caina). That there are no Muslims on the list probably has less to do with my enduring suspicion of that religion, and rather more to do with a neurotic fear that I’m accidentally creating some kind of Inter-faith Meeting Point… sheesh, Hell Forbid! 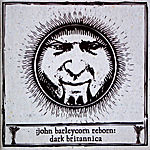 First, I’d like to discuss Cold Spring Records’ superb double-CD JOHN BARLEYCORN REBORN: DARK BRITANNICA. Available at www.coldspring.co.uk, this collection of 33 songs contains some exquisitely dark and eloquent performances mainly by artists I’ve never before heard. But, like the heathen folk of Waldteufel, Werkraum and Sangre Cavallum, these new performances of such hoary standards as ‘John Barleycorn Must Die’ and ‘North Country Maid’ have brought their very essences back to life. My favourites at the present time are most definitely Andrew King’s cadaverous delivery of ‘Diverus & Lazarus’ and the tragic eight minutes of Charlotte Greig’s epic ‘Lay the Bent to the Bonny Broom’, which brought me to tears the first coupla times I listened. What a baby! With true poetic timing, my next choice is RAUHNACHT by Waldteufel themselves, and what a famous clamour this record is destined to become. Leader Markus Wolff is here joined by such dark folk luminaries as members of Strumpercht, Werkraum, Allersellen and L’Acerphale, all of whom have conspired to create a dizzying ritual album of music that (both in vibration AND sound) swings from the Wodenist grove to the black metal church burning, concluding at last with the startling post-apocalyptical experiment of the 12-minute ‘Ur-Odin’. Bravo, mein hairies, this is a perfect one to accompany a crawl through the undergrowth during the 4am Mushroom Experience, and no shirking! Grab this burnt offering from www.waldteufel.net and tell them Lofty sent you. We next move to the stunningly clear acoustic recording of SONGS OF MOONLIGHT & RAIN by Stone Breath, on Dark Holler Records (www.somedarkholler.com). Despite leader Timothy being a practising Christian, fortunately none of that rubs off on these icily-beautiful recordings, which are as absolutely heathen in their execution and vitality as any of the Scandinavian Dark Folk ensembles that I’ve encountered. Perhaps, like the Armenians’ curiously pagan and polytheistic Christianity, Timothy’s revelation is just the kind of direct interface with Christ that the church has spent the past 1500 years attempting to outlaw. For we heathen rock’n’rollers, however, this Gnostic artist is essential no matter with whom or what he would choose to align himself. Following on from these unexpected realms of the Shiny Guy, we next descend into the bizarre Christian underbelly of Satanism and its demon-obsessions, for Caina’s nightmarish MOURNER is most serpently worthy of taking a trip downstairs for. Hell kiddies, the leader of this motherlode is only twenty years old, yet they’re already cooking up the kind of essential-for-your-mental-health Black Metal that Furze achieved with their timeless epic ‘Satanas’ Megalomania’. I gots to say I worry hugely about the final destination of Caina’s leader Andrew Curtis-Brignell, especially as he’s bringing forth such dark revelations so young. Still, use it or lose it says I, and we can only be thankful that this young ‘un makes such demands of himself. 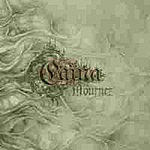 Released on America’s Profound Lore Records (www.profoundlorerecords.com), I suggest you make a real effort to experience MOURNER firsthand, for its trajectories are always essential and often spellbinding. We now emerge into the psychically easier (though no less aurally demanding) territories of CUTLERY HITS CHINA: ENGLISH FOR THE HEARING IMPAIRED by Israel’s electro-braniac stuporgroup power trio Grave In The Sky. Coming on like the Pop Group’s Mark Stewart chanting apoplectically over a more amped/caffeined Kabalist with Khanate’s rhythm section, Poochlatz’s Dalek-voiced singer Rani Zager drags this bizarre vocalist/bassist/drummer three-headed secular beast by the nose, the ensemble coming on like some LSD-fuelled Orange Day parade-of-berserkers through the heart of Catholic Belfast. I s’pose some fucker’s got to do it, especially if – as in the case of their belligerent epic ‘Donnie Darko’ – the results occasionally sounds like all four of the Doors’ on largactyl playing ‘Wild Child’ through a factory-sized Vent-Axia. Israeli Post-Industrial Ritual Forced-March Post-Blues, anyone? To ensure you’re properly arrested when the Monotheistic Culture Police raid you in a coupla years and discover your copy, get your radical asses down to Heart & Crossbone Records’ website at www.hcbrecords.com. I’ll now conclude this month’s reviews with DESCENSION, the epic debut album by France’s Aluk Todolo, on Public Guilt Records (www.stickfiguredistro.com). For their playing unites Krautrock with Zeuhl via classic No Wave, and rocks mightily. Commencing like the soundtrack from some forgotten gulag escape movie, this power trio’s time-honoured guitar/bass/drums line-up is outstandingly meditative and un-clichéd. Once the album kicks deep in there, it’s as though these gentlemen are hypnotized and playing along while watching an animé interpretation of Ted Hughes’ Iron Man (now re-titled ‘The All New Adventures of Iron Man’ and in its third series replete with failed Scrappy Doo counterpart), and in this episode he’s fumigating the entire West Midlands conurbation with an all-purpose Heavy Rock deodorant/pesticide. Very Cleveland, very Can, very This Heat, very Magma, but very much its own original thing, and definitely another necessary part of the puzzle that leads us to the Rue d’Awakening. Okay, that’s about it for November. But I do wanna say a huge thanks to everyone who wished me a happy 50th birthday. All in all, it was a very low-key affair despite being highly psychedelically-informed, and I’m delighted to report that the English landscape around my home looked more incredible and mythic on October 21st 2007CE than ever before. Here’s to another 50 years spent in simultaneously loftily high and abjectly low psychic and physical states, and also here’s to redeeming these islands from the sell-their-own-mother Corporate Greedheads and the energy-sapping Religious Vampires who threaten to engulf us.